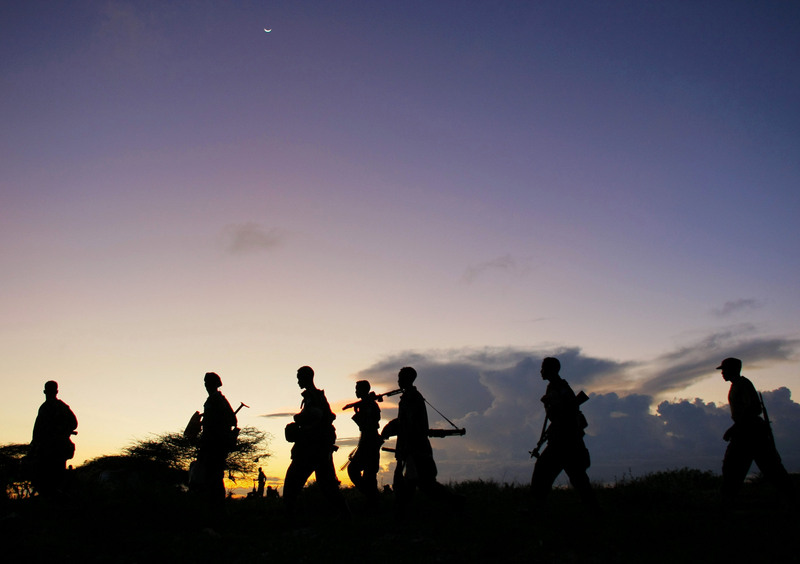 Soldiers of the Somali National Army (SNA) walk at dusk under a rising crescent moon near the outskirts of Afgooye, a town to the west of Somali capital Mogadishu. On the third day of the SNAs joint offensive with the African Union Mission in Somalia (AMISOM), dubbed Operation Free Shabelle, troops have advanced to almost two kilometres outside strategically important Afgooye, having captured along the way swathes of territory previously under the control of the Al Shabaab insurgent group. BOSASSO (HAN) December 7.2016. Public Diplomacy & Regional Security News.By Abdiqani Hassan. Soldiers allied to the Western-backed Somali government killed three fighters loyal to the Islamic State in northern Somalia on Monday as they pressed ahead toward the insurgents’ main stronghold, officials said. The troops, alongside militia fighters, launched an offensive last week to wrest back control of the port town of Qandala in the semi-autonomous region of Puntland. The insurgents launched counterattacks away from their stronghold, in areas along the route to Qandala, and that led to the fighting on Monday in an area west of the port. “Our forces attacked IS fighters in Obolohe valley today, killing three of their fighters and injuring two others,” Mohamed Saiid, a Puntland military official involved in the operation, told Reuters. The Obolohe valley is on the outskirts of Bashaashin village some 34 kilometres west of Qandala. “Three were injured from our side. The (IS) fighters ran deeper into the hills,” Saiid added. The militants are thought to number in the low hundreds and are led by Abdiqadir Mumin, who broke away from the main al Shabaab insurgency last year and swore allegiance to Islamic State. His group has no known operational links to Islamic State in the Middle East and Qandala is the first town that they seized. Al Shabaab is fighting the shaky U.N.-backed government to impose a strict interpretation of Islamic law in Somalia, which has been at war for more than 25 years.